Reading and share top 1455 famous quotes and sayings about Brave by famous authors and people. Browse top 1455 famous quotes and sayings about Brave by most favorite authors. 1. 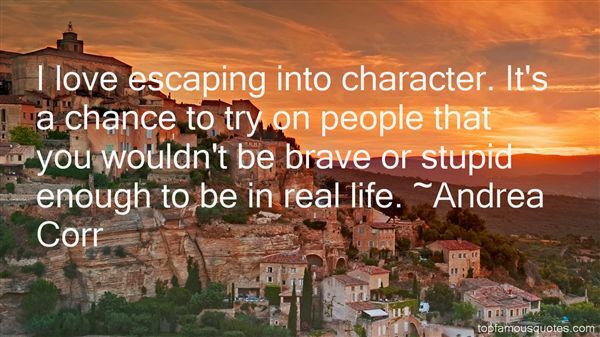 "I love escaping into character. It's a chance to try on people that you wouldn't be brave or stupid enough to be in real life." 2. "We become brave by doing brave acts." 3. "Will there be no more irisesin your garden tomorrow morning,or perhaps any rainbows that covetyour roof will melt into Rorschach pastelsin your gutters and birdsongs in your windowsturn into shrill shriekings as you recallhow, for one moment, you were as braveand equal to beauty as that which you feel?Can't a world end gloriously?" 4. "In all the difficult decisions that I made through the course of running Loudcloud and Opsware, I never once felt brave. In fact, I often felt scared to death. I never lost those feelings, but after much practice, I learned to ignore them. That learning process might also be called the courage development process." 6. "So it is written - but so, too, it is crossed out. You can write it over again. You can make notes in the margins. You can cut out the whole page. You can, and you must, edit and rewrite and reshape and pull out the wrong parts like bones and find just the thing and you can forever, forever, write more and more and more, thicker and longer and clearer. Living is a paragraph, constantly rewritten. It is Grown-Up Magic. Children are heartless; their parents hold them still, squirming and shouting, until a heart can get going in their little lawless wilderness. Teenagers crash their hearts into every hard and thrilling thing to see what will give and what will hold. And Grown-Ups, when they are very good, when they are very lucky, and very brave, and their wishes are sharp as scissors, when they are in the fullness of their strength, use their hearts to start their story over again." 7. "For my own part I would as soon be descended from that heroic little monkey, who braved his dreaded enemy in order to save the life of his keeper; or from that old baboon, who, descending from the mountains, carried away in triumph his young comrade from a crowd of astonished dogs—as from a savage who delights to torture his enemies, offers up bloody sacrifices, practices infanticide without remorse, treats his wives like slaves, knows no decency, and is haunted by the grossest superstitions." 8. "What's the bravest thing you ever did?He spat in the road a bloody phlegm. Getting up this morning, he said." 9. "She is staring into hell and I'm not brave enough to join her." 10. "They are not brave, the days when we are twenty-one. They are full of little cowardices, little fears without foundation, and one is so easily bruised, so swiftly wounded, one falls to the first barbed word. To-day, wrapped in the complacent armour of approaching middle age, the infinitesimal pricks of day by day brush one but lightly and are soon forgotten, but then—how a careless word would linger, becoming a fiery stigma, and how a look, a glance over a shoulder, branded themselves as things eternal." 11. "Liverpool has always made me brave, choice-wise. It was never a city that criticised anyone for taking a chance." 12. "Far back in the mists of ancient time, in the great and glorious days of the former Galactic Empire, life was wild, rich and largely tax free. Mighty starships plied their way between exotic suns, seeking adventure and reward among the furthest reaches of Galactic space. In those days spirits were brave, the stakes were high, men were real men, women were real women and small furry creatures from Alpha Centauri were real small furry creatures from Alpha Centauri. And all dared to brave unknown terrors, to do mighty deeds, to boldly split infinitives that no man had split before--and thus was the Empire forged....In these enlightened days, of course, no one believes a word of it." 13. "I would not sacrifice a single living mesquite tree for any book ever written. One square mile of living desert is worth a hundred 'great books' - and one brave deed is worth a thousand." 14. "If you live in Milton, you must learn to have a brave heart, Miss Hale. '‘I would do my best,' said Margaret rather pale. ‘I do not knowwhether I am brave or not till I am tried; but I am afraid Ishould be a coward." 15. "The bravest are usually those whom we do not know or hear about, those anonymous men who dig the trenches, who produce the food." 16. "Bravery was doing something dangerous without thinking. Courage was walking into danger, knowing full well the risks." 17. "A headsman's sword is no fit end for brave Ser Gregor. We have prayed so long for his death, it is only fair that he pray for it as well." 18. "It is always brave to say what everyone thinks." 19. "But I love being scared. I think you're brave only when you do things that scare you. I've always used fear as a motivator. I'm not sure why." 20. "During the Second World War, nobody built any concert halls or theaters. After the war, Lincoln Center was a very brave project because all those architects had never built a theater before. We've learned a lot since then about the nature of materials and the isolation that's required." 21. "What do I care how 'e looks? I am good-looking enough for both of us, I theenk! All these scars show is zat my husband is brave!" 22. "You thought I would not weesh to marry him? Or per'aps you hoped?" said Fleur, her nostrils flaring. "What do I care how he looks? I am good-looking enough for both of us, I theenk! All these scars show is zat my husband is brave! And I shall do zat!" she added fiercely, pushing Mrs. Weasley aside and snatching the ointment from her." 23. "Mrs. Darling: There are many different kinds of bravery. There's the bravery of thinking of others before one's self. Now, your father has never brandished a sword nor fired a pistol, thank heavens. But he has made many sacrifices for his family, and put away many dreams. Michael: Where did he put them? Mrs. Darling: He put them in a drawer. And sometimes, late at night, we take them out and admire them. But it gets harder and harder to close the drawer... He does. And that is why he is brave." 24. "I want to get the words "Courage" and "Bravery" tattooed across my back, so people could associate me with those things as they read them while they chase me." 25. "And you're everything I don't want." Julie pushed away, breaking his embrace, and shook her head. "If you loved me, you couldn't have done this. You couldn't have been so careless with me. You know pain, and loss, and hurt better than anyone." She hated each word as it came out of her mouth. "And that's what you gave me. I know that it's not the same. I know yours is worse. I'm so sorry for you, Matt. For your whole family. You've all been through hell. And you've been braver than anyone could. But I hurt now, too. And I can't love you." 26. "I knew that if the feat was accomplished it must be at a most fearful sacrifice of as brave and gallant soldiers as ever engaged in battle." 27. 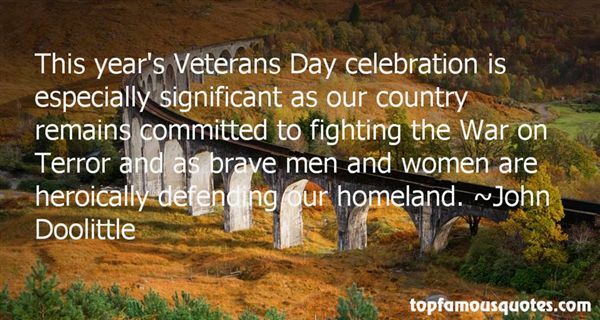 "This year's Veterans Day celebration is especially significant as our country remains committed to fighting the War on Terror and as brave men and women are heroically defending our homeland." 28. "I have no choice of living or dying, you see, sir--but I do have a choice of how I do it. If I tell them not to fight, they will be sorry, but they will fight. If I tell them to fight, they will be glad, and I who am not a very brave man will have made them a little braver." 29. "He must have been very brave and very strong, at the end, not to do himself in." 30. "The brave man uses wrath for his own act, above all in attack, 'for it is peculiar to wrath to pounce upon evil. Thus fortitude and wrath work directly upon each other." 31. "There's an argument for saying that brave men deserve what they get, but it's a serious business forcing cowards to stand in harm's way." 32. "Give me a hot coal glowing bright red, Give me an ember sizzling with heat, These are the jewels made from my beak. We fly between the flames and never get singed We plunge through the smoke and never cringe. The secrets of fire, its strange winds, its rages, We know it all as it rampages Through forests, through canyons, Up hillsides and down. We track it. We'll find it. Take coals by the pound. We'll yarp in the heart of the hottest flame Then bring back its coals an make them tame. For we are the colliers brave and beyond all We are the owls of the colliering chaw!" 33. "There is a kind of crying I hope you have not experienced, and it is not just crying about something terrible that has happened, but a crying for all of the terrible things that have happened, not just to you but to everyone you know and to everyone you don't know and even the people you don't want to know, a crying that cannot be diluted by a brave deed or a kind word, but only by someone holding you as your shoulders shake and your tears run down your face." 34. "Being brave enough to be alone frees you up to invite people into your life because you want them and not because you need them." 35. "Being brave is when you have to do something because you know it is right, but at the same time, you are afraid to do it, because it might hurt or whatever. But you do it anyway." 36. "I'm not this unusual," she said. "It's just my hair. "She looked at Bobby and she looked at me, with an expression at once disdainful and imploring. She was forty, pregnant, and in love with two men at once. I think what she could not abide was the zaniness of her life. Like many of us, she had grown up expecting romance to bestow dignity and direction. "Be brave," I told her. Bobby and I stood before her, confused and homeless and lacking a plan, beset by an aching but chaotic love that refused to focus in the conventional way. Traffic roared behind us. A truck honked its hydraulic horn, a monstrous, oceanic sound. Clare shook her head, not in denial but in exasperation. Because she could think of nothing else to do, she began walking again, more slowly, toward the row of trees." 37. "Your truest friends are the ones who will stand by you in your darkest moments--because they're willing to brave the shadows with you--and in your greatest moments--because they're not afraid to let you shine." 38. "The men stop coming after Hunt goes missing. We learned from the last brave soul to visit that they whispered all sorts of stories to answer his disappearance. My favorite is that we ate him. We cooked him up with our whore-earned corn, a dozen rats' eyes, and a bat wing. Even I couldn't have thought of anything more perfect." 39. "Am I getting braver, or just getting accustomed to being terrified?" 40. "Necessity makes even the timid brave." 41. "Ah me! think, sister, how our father perished, amid hate and scorn, when sins bared by his own search had moved him to strike both eyes with self-blinding hand; then the mother wife, two names in one, with twisted noose did despite unto her life; and last, our two brothers in one day,-each shedding, hapless one, a kinsman's blood,-wrought out with mutual hands their common doom. And now we in turn-we two left all alone think how we shall perish, more miserably than all the rest, if, in defiance of the law, we brave a king's decree or his powers. Nay, we must remember, first, that we were born women, as who should not strive with men; next, that we are ruled of the stronger, so that we must obey in these things, and in things yet sorer. I, therefore, asking the Spirits Infernal to pardon, seeing that force is put on me herein, will hearken to our rulers. for 'tis witless to be over busy." 42. "Be true, be brave, standAll the rest is darkness." 43. "Bodily vigor is good, and vigor of intellect is even better, but far above both is character. It is true, of course, that a genius may, on certain lines, do more than a brave and manly fellow who is not a genius; and so, in sports, vast physical strength may overcome weakness, even though the puny body may have in it the heart of a lion. But, in the long run, in the great battle of life, no brilliancy of intellect, no perfection of bodily development, will count when weighed in the balance against that assemblage of virtues, active and passive, of moral qualities, which we group together under the name of character; and if between any two contestants, even in college sport or in college work, the difference in character on the right side is as great as the difference of intellect or strength the other way, it is the character side that will win." 44. "It's easy to be brave when they're not my fears." 45. "Eric called Al's suicide brave, and he was wrong. My mother's death was brave. I remember how calm she was, how determined. It isn't just brave that she died for me; it is brave that she did it without announcing it, without hesitation, and without appearing to consider another option." 46. "What helps luck is a habit of watching for opportunities, of having a patient but restless mind, of sacrificing one's ease or vanity, or uniting a love of detail to foresight, and of passing through hard times bravely and cheerfully." 47. "Men, we don't need you to be a knight in shining armor. We just need you to be a little bit brave, just a little bit. And some of them are, and that's what he does." 48. "He was drowned, he used to say, and lying on a cliff with gulls screaming over him. He would look over the edge of the sofa down into the sea. Or he was hearing music… But "Lovely!" he used to cry and the tears would run down his cheeks, which was to her the most dreadful thing of all, to see a man like Septimus, who had fought, who was brave, crying. And he would lie listening until suddenly he would cry that he was falling down, down into the flames!" 49. "The bravery of Stanley Kramer's 'Guess Who's Coming to Dinner' amounted to two Hollywood legends - Katharine Hepburn and Spencer Tracy - telling the world that a black son-in-law is something they can live with, and so should you, especially if he looks like Sidney Poitier and has degrees." 50. "I saw a moving sight the other morning before breakfast in a little hotel where I slept in the dusty fields. The young man of the house shot a little wolf called coyote in the early morning. The little heroic animal lay on the ground, with his big furry ears, and his clean white teeth, and his little cheerful body, but his little brave life was gone. It made me think how brave all living things are. Here little coyote was, without any clothes or house or books or anything, with nothing to pay his way with, and risking his life so cheerfully — and losing it — just to see if he could pick up a meal near the hotel. He was doing his coyote-business like a hero, and you must do your boy-business, and I my man-business bravely, too, or else we won't be worth as much as a little coyote." Use your safe word if you get scared, honey. ""I'm fine." Her voice came out husky. "Yes, you are, aren't you?" Who Was Talking About "Brave"?